This year at MWC in Barcelona, ​​ Huawei has released their first hybrid tablets – to compete with the iPad Pro and Microsoft Surface. Huawei MateBook is 12-inch full HD touch screen two-in-one device, is a powerful gadget weighing 635 grams on Intel Core M 3,1GGts with 8GB of RAM and SSD 512 GB. The two-in-one device, called the MateBook, functions as a laptop, but the screen can be detached to operate as a tablet, which will run Microsoft’s Windows 10. MateBook additionally can be used with a stylus – the MatePen – which doubles as a laser pointer for presentations. The device weight only 635 grams- this is one of the lightest tablet with a diagonal. Thickness is 6.9mm.Screen resolution – 2160h1440. For comparison: surface pro has a resolution 2736h1824 and ipad pro – 2732h2048. The manufacturer promise that the battery will last 10 hours. 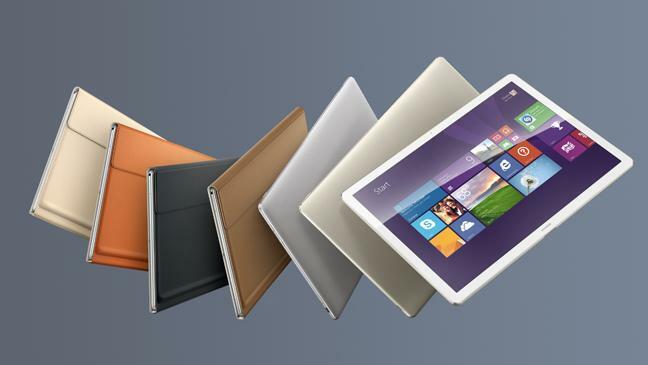 The gadget is based on the intel core M processors – are available option with the M3 M5 and M7. Customers will be able to choose the version with a 4 GB or 8 GB ram, SSD will be from 128GB up to 512 GB capacity. The case MateBook keyboard is soft and ecological PU leather, the perfect choice to combine style with functionality. The durability of the keyboard case also provides an ideal level of protection. The keyboard has a key pressed 1.5 mm and a design of key chiclet: the surface of the keys is bigger to reduce typing errors. The built-in touchpad that supports multi-touch technology uses smooth and precise finger movements and combines comfort and utility. With a base price of USD 699 / € 799, MateBook responds to the demand for portable and elegant smart devices that enable users to stay connected in any environment. Mate Book is a first class product which is Design as a total solution for consumers who enjoy the flexibility of a convertible that perfectly balances mobility, productivity and design. MateBook has a wireless access point wi-fi so users stay connected when they have no traditional Internet connection. Other functions ensuring efficient mobile experience are an integrated transfer capability allows data transfer mode documents with drag and drop to and from Android smartphones. The device also features Huawei’s power-saving technology and the MateBook’s battery can be fully charged in just two-and-a-half hours. When there is not enough time for a full charge, the device can power up to 60 per cent battery strength in just one hour. MateBook be available in Asia, Europe and North America in the coming months, in two stylish colors: gray and gold. Next Story → Digital revolution: risk for the middle class?